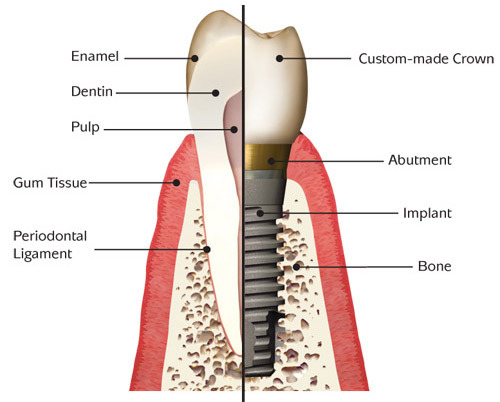 The procedure for Dental Implants? The total procedure for dental implants is completed in just two simple phases and the process to restoring your mouth to its former glory will be done in just 6 – 9 months. The first phase is the surgical phase and this is done by your dental practitioner with local anaesthetic. First of all, your mouth will be numbed by using local anaesthesia, this is essential for in the process of applying your dental implant. A small incision is made in your gums where your dental implant is going to be placed. A drill is then used in order to create a space for the implant to be inserted. There are a couple of different types of dental implants which vary in size and height. One of our dental experts will determine which options are the best for you depending on which teeth/ tooth that you need replacing. Subperiosteal Implants – These implants are used underneath your gum but on or above your jawbone. This implant is used on patients that have a shallow jawbone or those who don’t want to undergo the procedure in order to rebuild it.